“Mighty Oregon” Football DVD has it ALL! The Thompson family, who lived in Cottage Grove, followed Duck football through thick and thin and Jerry became a student manager for the football team in 1969 and 1970. After earning a degree in television and film, Thompson decided in 1987 to bring the history of Oregon football to life via video. The first version of “Mighty Oregon” came out on VHS and contained film action of such Ducks as Bill Bowerman (yes, he played football), Norm Van Brocklin, George Shaw, NFL Hall of Famers Mel Renfro, Dave Wilcox, Dan Fouts and Gary Zimmerman; virtually every Duck football player of any significance. Over 50 players and coaches (Len Casanova, John McKay, Jerry Frei, John Robinson, and Rich Brooks to name a few) were also interviewed). The new DVD contains all of that plus all of the Mike Bellotti and Chip Kelly era. There are numerous features such as humorous Duck tales, fantastic finishes, greatest hits, recruiting stories, action footage of every record-breaking play and coverage of every bowl game. 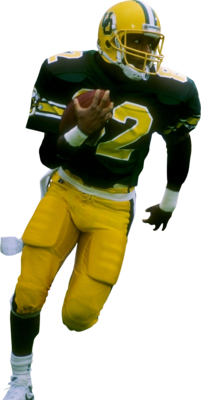 Thompson takes his greatest satisfaction in a “seek and find” mission/obsession in 1987 to obtain footage of the 1917 Rose Bowl game in which Oregon beat Penn 14-0…Oregon’s only Rose Bowl win until this last year. The University of Oregon, Penn, the Rose Bowl committee and numerous film archives around the U.S. were contacted to no avail. In a visit to Portland, Thompson heard a rumor that some footage of the game was on an old “Jim Thorpe, All-American” film. Thompson rented the movie and was disappointed to find none of that game was on that movie. By a quirk of fate — or divine providence as Thompson views it — he was visiting with a friend who lived a block away and told him about his fruitless search. The neighbor, who was not a sports fan at all, said he had for some unknown reason, recorded a documentary about college football off of his television, and told Thompson he could watch it. Early in the video, the narrator talked about Dwight Eisenhower and Knute Rockne playing college football. Some old film footage was shown as the narrator talked about the two men, and lo and behold, the footage being shown was of the Oregon-Penn game! Thompson knew it was that game because of the still photos he had seen from the game. In the film you could see No. 7, Penn’s Heine Miller, playing without a helmet. The referees’ crew cut and v-neck sweater were also a dead giveaway. 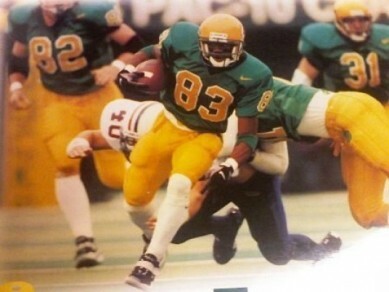 Thompson contacted the producer in Los Angeles, who said he had no idea where the footage came from, but he granted Thompson rights to use it for the “Mighty Oregon” video. 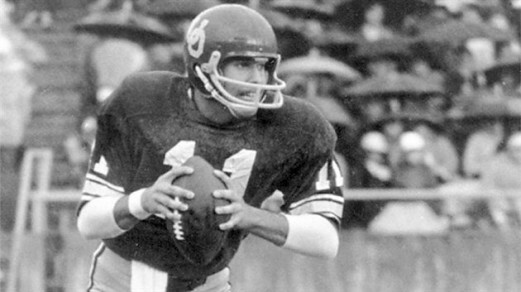 As an example of the “obsession” Thompson had about the project, the day after being released from the hospital after his second hip-replacement surgery, Thompson took his crutches and flew alone to San Diego to interview Oregon greats Dan Fouts, Mel Renfro, Woodley Lewis, Gunther Cunningham and Dave Grayson. About one-half of the new DVD covers 1894 through the 1995 Rose Bowl, and the second half details 1995 through 2012. The video is organized into decades and years, so fans can easily go to periods in which they are most interested. One can see color footage of Oregon-Oregon State from 1939, and even baseball Hall of Famer Jackie Robinson playing football for UCLA at Hayward Field in 1940. 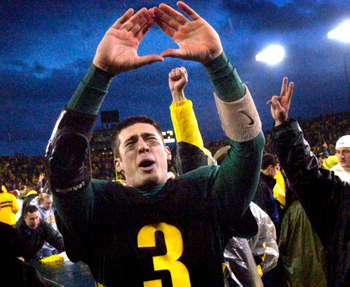 Thompson wrote and produced the video, which is licensed by the UO’s IMG. It is hosted by Dan Fouts and Tim Stokes and is narrated by Jerry Allen. He priced the 4-DVD set at $29.95. Thompson has also been the editor of Ducks Illustrated magazine for the past 11 years.